Bowman Field, home of the Williamsport Crosscutters, is 92 years old and seats approximately 2,500 fans. It hardly seems like a likely setting for a Major League game. But Major League Baseball has been played at Bowman Field in each of the last two seasons, a tradition that will continue into 2019. The Little League Classic -- a celebration of the Williamsport-based Little League World Series -- brings big league pomp and circumstance to a Class A Short Season environment. This year's iteration took place Sunday evening, with the Philadelphia Phillies -- the Crosscutters' parent club -- losing to the New York Mets. While the Little League Classic is just one night, a comparative blip on the 162-game season schedule, a massive amount of work goes into making it happen. This activity significantly disrupts the normal operating routine of the Crosscutters, a New York-Penn League entity that hosts 38 home games a year. Carl E. Stoltz Field, located across the street from Bowman Field, is the birthplace of Little League Baseball. Gabe Sinicropi, Crosscutters vice president of marketing, has been with the franchise since its previous incarnation as the Geneva Cubs (the team moved to Williamsport in 1994). For him, seeing a Major League game played at Bowman Field was, in a word, surreal. "You know, it's so different, and no matter how long you've been around, when you're associated with an event like this it's still bigger than you would ever think," said Sinicropi, who also serves as a public address announcer at Little League World Series games. "The thing is, this is a one-time event so everything has to be planned, set up, taken down. So the logistics involved in this three-hour game boggle the mind. I mean it really does. And I've learned a lot over the last couple years, even just by osmosis, by just being around the whole thing. We have a part in it, but it's a minor part overall and just being around and helping them this way or that way, it's been eye-opening." Having to cede control to Major League interlopers brings to mind the common television and movie crime drama trope of local law enforcement being pushed to the sidelines by take-charge federal agents. Sinicropi acknowledges that sort of friction, but uses a different, perhaps more relatable, analogy. "It's like people coming into your house and saying, 'OK, we're going to take over your house for about three weeks and we're gonna do what we want in it and on the last day we're gonna have a big party. We're gonna invite all our friends to your house,'" he said. "And it's a little disconcerting, especially in the beginning. I mean, I'll admit last year it was difficult. This year it's easier in that we know the people and they know us and we both know the lay of the land. It's been easier for them, easier for us, and we've gotten used to it. But in the beginning, man, it was very disconcerting. No control. ... There's someone else who takes precedence over what happens on the field and how it happens." Gabe Sinicropi, Crosscutters vice president of marketing, has worked for the team since its 1994 inception. Indeed, Bowman Field during the Little League Classic is a far cry from what it is for a normal New York-Penn League game. (Tickets to the game are not made publicly available, with most going to Little League teams and those affiliated with the series.) Three weeks prior to its occurrence, Major League Baseball builds an operations compound outside the ballpark, a small maze of tents and trailers featuring makeshift offices and necessary additions such as a media workroom. The Crosscutters attempt to conduct business as usual in the midst of that, even as the spectacle around them becomes more and more surreal. "There's way more staff here than there would be for a Crosscutters game, even if there would be the same amount of people in the stands," said Sinicropi. "But as far as the Crosscutters go, we've got about 60 people staffing the event. All food and beverage is handled by us, and there's a lot of food and beverage because Major League Baseball buys two meals for all the kids in the stands. And we do ticket taking, ushering, some directional hosts, things of that nature, and some of the grounds crew." Ryan Sargent, a Crosscutters intern going into his senior year at Mansfield University, was amazed at the contrast. "It's a different animal," he said. "Getting to see some of the faces that are coming through here -- ESPN, Baseball Tonight, things like that. ... The prep that went into this, even when my internship started, the groundwork that has been laid has been pretty crazy to watch." Meanwhile, at the Crosscutters' concourse concession stand, second-year food and beverage worker Deanna Dockey was prepping for a night like no other. "So many of the [Little League players] don't know English, so the hardest part is nobody has a clue what's on the menu," she said. "They'll point, and some of them might put hot sauce on their hot dog thinking it's ketchup. ... But the kids are amazing. I don't know if American kids, in that situation, would be as willing to learn." Any confusion and complications precipated by the Little League Classic are far outweighed by the long-term benefits to the Crosscutters organization. An eye-popping series of Bowman Field improvements have been made by Major League Baseball, in order to have the facility meet its exacting standards. "The stadium change in the last two years, it's a sea change," said Sinicropi. "I mean, it's everything. It's a whole new look and feel to the stadium. Just with the new seats, the new dugouts, a new playing surface. Bullpens moved to the place [beyond the outfield fences] where bullpens are supposed to be. ... And then there's the [Logger's Landing] party deck down the right field line. It's just a total change in the whole feeling of Bowman Field. It really is. ...That's what we wanted. When you walk up that ramp and you see it, it's totally different than what people have seen before." The game also allows Crosscutters staff to interact with team alumni. Sunday's game featured 13 Williamsport alumni -- 12 members of the Phillies as well as New York Met Jose Bautista (a member of the 2001 club). "That's what makes today extra-special, that our parent club is the team that's here and so many of them lived here for a summer or two. Some of them we have a connection to all the time, some of them not at all, but the biggest thing is they all were excited to see [Crosscutters director of smiles] Rhasan [West-Bey] when they got off the bus. That was one of the first things we posted. Rhashan was there to greet him and he got a lot of hugs and a lot of 'Hey Rhashans' and that made Rhashan's day and I think a lot of the players were happy to see him too." 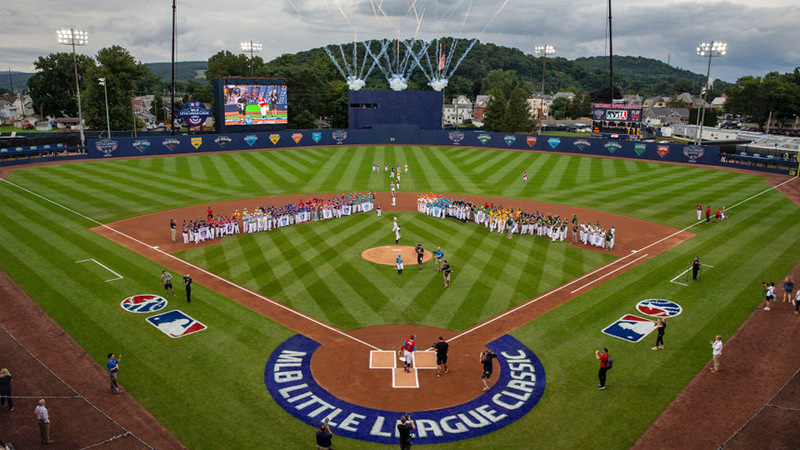 On Sunday evening Major League Baseball announced that the Little League Classic will return in 2019, this time pitting the Chicago Cubs against the Pittsburgh Pirates. But for now, it's time for the Major League circus to leave town so that the Crosscutters can prep for Tuesday's home game. After that, all that's left will be the memories. "I feel we're the center of the baseball universe tonight," said Sinicropi. "I mean, between the Little League World Series and this game, this is it. It's pretty darn cool, and we're just happy to be a part of it."